This three part film series – Goddess Remembered, The Burning Times, and Full Circle, by Donna Read, now released as Women and Spirituality: the Goddess Trilogy , (by AliveMind in 2008), was first released on video almost two decades ago. It was shown on some television networks, and received awards, and fired many hearts, but it remained largely within a specialist community of seekers and had seemed destined to remain that way as quickly changing technology left it sitting on shelves. The content seemed destined to remain alive only in the hearts and minds of a select group, largely women, who perceived here a documentation of their spiritual heritage, that would likely never receive wider recognition as a bona fide indigenous tradition amongst “world” religions of our times. However, it seems that this spiritual heritage has a strong urge to be, and its release as DVD in these times of intense global networking promises a reception by a now much larger audience: and there is a readiness for it, as humans face more clearly some failure in presently accepted modes of relationship with our place of being – this Earth. The designation of this material as “women’s spirituality” is grounded in the fact that it originates in female experience of regeneration of life, and probably in the fact that it is mainly women who have practiced it. I offer that although this may be so, the material is relevant to any and all beings concerned with the regeneration of life. The male, in the oldest of human cultural traditions, was usually included amongst such aspirants, and always had a role in the support and nurturance of the female regenerative capacities – and so may anyone. This role need not be a subordinate role as is sometimes thought, and does not succeed when it becomes a dominating possessive role, as it commonly has. It is best rather when supportive of this central task of all genders – indeed that of all species – regeneration … Creativity. Women are half or more of the human race, and play a central part in the web of life: the fact that material such as this needs to be classified as “women’s spirituality” and often marginalised, is perhaps an indictment of current religious thinking on the planet. As the first film in the series – Goddess Remembered – points out, we have lived for the last 6000 years in a context that increasingly celebrated the “hero”/ conqueror more than it did the role of nurturer. This is obvious in the prevalence of “war” metaphor in everyday language, in the telling of history as a series of conquests, and in the fact that last century was the bloodiest one hundred years on record. Our times seem to require some focussed attention on what real power might be, and how it might be exercised and supported. Goddess Remembered offers a vision of a way of being – a way of relationship – with other and place, that honours the miracle of life and its organic power. It is based in very recent evidence – from just last century – of civilizations that existed for millennia without chronic war, and of social and religious paradigms wherein women’s roles were central and respected. Whilst many argue about aspects of this evidence, it is also apparent that current paradigms wherein female imagery is backgrounded and nature is seen as a resource to be exploited, are not ethical or functional. Moreover, Goddess Remembered is an aesthetic success – it is pleasurable viewing, interspersed with poetic praise of the Sacred by Her many names, and the inspiring music and voice of Loreena McKennitt. 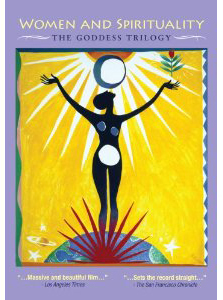 It informs and re-stories, and introduces early and still current Goddess advocates, researchers and authors – Susan Griffin, Luisah Teish, Merlin Stone, Carol Christ, Starhawk, Charlene Spretnak, Jean Bolen, Shekhinah Mountainwater being amongst those better known. The second film in the series, The Burning Times , covers the territory of what happened in relatively recent human history. It begins at the waters of Bath in the UK where the Romans appropriated the sacred place of the Celtic Triple Goddess Sulis, for their own Goddess Minerva. It is pointed out how very civilized this was in comparison to the tactics of the later Christian empire, whose jurisdiction covered more widespread territory – throughout Europe and further, and into the hearts and minds of the people for generations. Over a period of a few hundred years of terror and death, the religion of the people – Paganism – was turned upside down, and the Christian devil was conjured into it. The christianisation of Europe involved a holocaust – with eighty-five percent of those condemned being women. The Burning Times tells some of this story and of how we live it yet still: how common it is to associate the shamanic female – the witch – with malicious intent, and her healing knowledge and midwifery with quackery. The document that expedited this European gynocide, the Malleus Maleficarum , is described by Matthew Fox – ex-Dominican priest – as a “pure study of repression”, which singled out women. There have been no monuments yet built in their memory. There has been no “sorry” said. There is little official or popular recognition of the integrity of the indigenous tradition that was decimated. This film is a monument – of the best kind. It is moving to hear this told so well, with art, interviews, historical fact, prose, and song. Full Circle documents the resurgence of rituals related to Earth cycles – in North America and the UK, and in Mexico amongst the indigenous peoples despite centuries of horrific persecution by their Christian conquerors. Full Circle documents how such ritual, and rituals related to moments of personal and cultural transitions, may be and are, experienced as a bonding force, creating a knowledge of belonging. The Earth, the Moon and the Cosmos – it is mentioned – have rituals: and the human needs to participate again in rituals that end our alienation from our habitat. Change happens from the inside out. And this recovered sense of belonging – which is what the root word of “religion” means – has no cult, no great gurus. Matthew Fox points out that “world” religions of our times grew up in patriarchal times, and are indelibly influenced by that. As Starhawk recounts, fear of complexity drives fundamentalisms of all kinds: Earth-based spiritualities stress freedom and diversity. Margo Adler speaks of how this is possible. The group of women around the kitchen table speak of how the personal is political, and the political is personal. I like to say it this way too: the domestic is cosmic and the cosmic is domestic. This religiosity understands words for Deity as metaphor. Some have difficulty with the term “Goddess” – but understand that it means a wholeness of being. Emphasis is placed on the significance of body knowledge – what we may know in touch and movement: how this is important for the regaining of trust lost in the horrific tortures of the past. I highly recommend this series as an educative resource for our times, for knowing more of our human story: so that we may orient ourselves more fully, and possibly flourish. What is being spoken of here is an expression and enhancement of spirit wherein regenerative capacities of the human, of life in general, expressed in female body intelligence/power and cultural practice, is held Sacred. Review by Glenys Livingstone, February 2008.